Manoa Youth Baseball League, Rookie Division “A” All Star Team. Included in Photo (From L to R): Front Row: Asa Hironaka, Cade Nakama, Brayden Bello, Noah Nakamura and Jase Kaneshiro. Second Row: Micah Bennett, Kekoa Payanal, Eli Iopa and Davin Okino. Third Row: Julian Romine, Keahi Bright, Matthew Chung and Kiana Aga. Fourth Row, Coaches: Jimmy Bennett, Ben Bright, Chris Nakamura and Jay Kaneshiro. 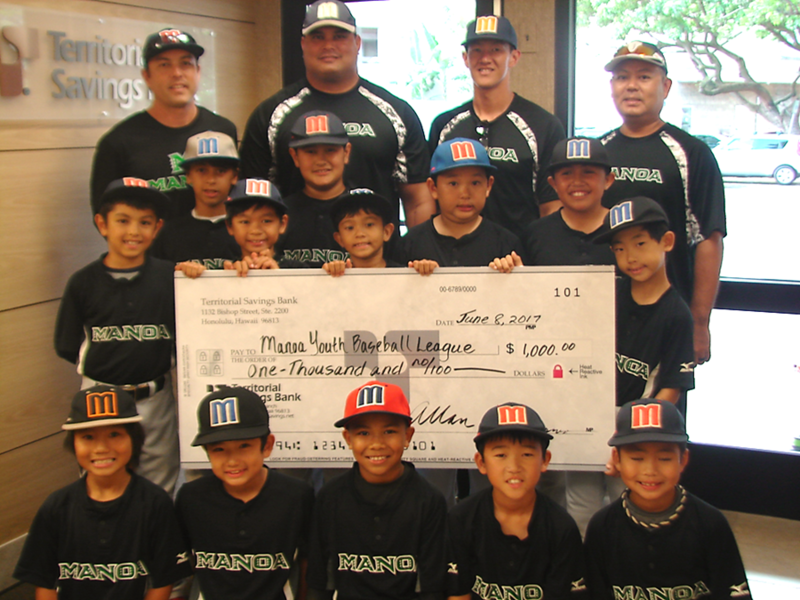 HONOLULU, HAWAII (June 9, 2017) – Territorial Savings Bank is proud to announce the donation of $1,000 to the Manoa Youth Baseball League, Rookie Division “A” All Star Team. The team is made up of 12 boys and 1 girl, age seven to eight, who were selected from 10 different teams based on input from their coaches and a team tryout. “We believe strongly in giving back to the community. By supporting youth sports programs like Manoa Youth Baseball, we hope to provide grass-roots support to programs and activities that enrich the lives of our customers and their families,” said Walter Ida, Senior Vice President of Investment Services at Territorial Savings Bank. Territorial Savings Bank began in 1921 offering home loans and savings accounts to the people of Hawaii. Today, with 29 branches on Oahu, Maui, Hawaii and Kauai, Territorial Savings Bank offers a full array of residential mortgage loans and attractive rates on checking and savings accounts. For more information, contact Maureen Lichter, Sales and Products Manager, Branch Retail Sales and Products, at (808) 951-1207.